Repetitive activities using the whole arm can create a strain of the muscles supporting the shoulder joint, also known as the Rotator Cuff. 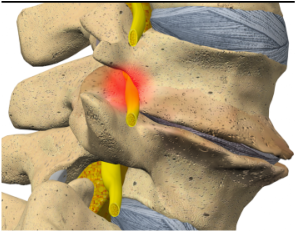 This can cause severe pain, stiffness, and weakness, even when inactive, as when trying to sleep. The SITS muscle complex(Supraspinatus, Infraspinatus, Teres major, and Subscapularis muscles) make up the Rotator Cuff and move the shoulder joint and upper arm and is especially active during racket sports such as tennis and throwing sports such as baseball. 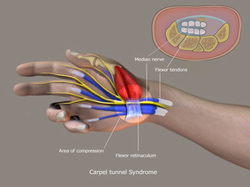 Again, repetitive strain of the muscles and tendons attaching to the inside(Golfer's) or outside(Tennis) of the elbow resulting in sharp pain/swelling/stiffness, and inability to perform exercises or daily activities involving lifting or grabbing without pain. This is not exclusive of only golfers and tennis players. Pain on the sole of the foot, usually after being inactive for prolonged periods, and especially in the morning when you get out of bed and take your first steps. May loosen up and feel a bit better when you are moving. 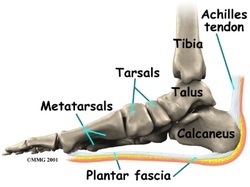 Pain at the rear of the foot and ankle, spanning as far up as the calf, and down to the bottom of the heel. 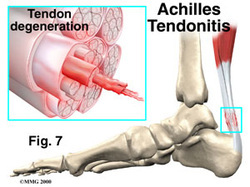 Usually aggravates when over stretching the Achilles Tendon while walking on an incline or sports with quick lateral movements or sprints. Pain in the front of the hip is common in cheerleaders and dancers, or those sitting at a desk for prolonged periods. Pain on the side of the hip can indicate Bursitis. Pain below the patella(knee cap), usually with running or jumping(track and field, basketball). Note: Some of the symptoms listed above can also be caused by certain conditions in the spine, such as disc bulging or herniation which can compress the spinal nerves leading down the arm and legs and into the hands/feet. We perform a chiropractic evaluation first to determine the source of the problem. As Chiropractors we believe that problems originating in the spine could be at the root of many of the above conditions. Misalignment and fixation of vertebral structures can prevent the musculoskeletal system from moving correctly and overcoming injuries sustained in sports, exercise or day-to-day actvities. 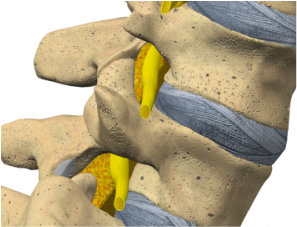 By adjusting the spine and restoring normal motion between the vertebra, the body is able to perform stronger, faster, and more biomechanically efficient. In addition, those wanting to exercise and get in better physical condition will tend to experience the greatest improvements overall when coupling their exercise routine with Chiropractic care.